The Fab Four get their own music game. Out of the box, Rock Band provides you with everything you need to create your own virtual rock band in the comfort of your own living room. The Rock Band franchise is the evolution of the rhythm game, a toe-tapping title that allows gamers to perform music from the world’s biggest rock artists with their friends using drum, bass/lead guitar and microphone peripherals. Gameplay simply involves matching the scrolling vertical, coloured notes on screen as you press buttons on your plastic guitar, or bash away on the drum kit. Singstar-style, you can also take to the mic and follow the lyrics on screen. Points are awarded for how well you keep in time to the music and then uploaded to the global leader-board. The Beatles: Rock Band uses that very same format from the first two Rock Band titles, but throws in a Beatles-themed story mode that restricts you to 45 tracks from the Liverpudlian group's glittering career. You can jam away alone on any one of the instruments, hook up with friends, or join a band online to rock the night away. You can rock through The Beatles career playing tracks and gigs in chronological order from The Cavern Club and Ed Sullivan’s studio,to Shea Stadium and the famous 1969 Apple Corps rooftop gig. 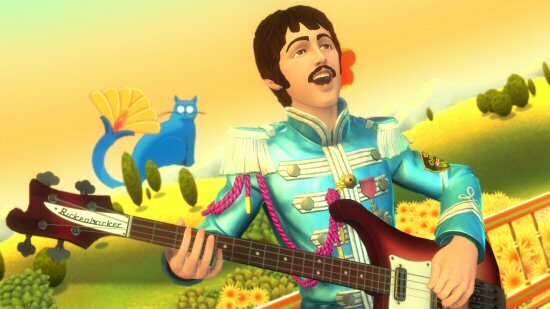 The story mode is backed up by animated and psychedelic backdrops, alongside audio extracts from the Fab Four. Strong performances are encouraged by the lure of photographs and audio clips of The Beatles and further downloadble content is on the way to ensure that Beatles' fans will, at some point, have access to all of their favourite tunes.